According to Google Play, only half (100k -500k) of the one million Magna Carta apps available, have been downloaded. Up from the 10k-50k that was listed there on Tuesday. The app, a partnership between Samsung and Jay-Z which was announced in a commercial during the NBA Finals, went live on Monday, June 24th. 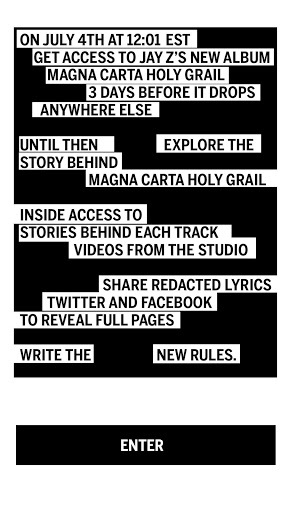 As a refresher, Samsung has agreed to purchase one million copies of Jay-Z’s new album Magna Carta Holy Grail at $5 a pop ($5 million), which will be given to Android users as a free download (via the app) on July 4th, three days before the official release date. This deal is significant for a number of reasons, but the one that stands out the most is that it provides a solution for the widespread problem of albums leaking on the internet before they are available for purchase which eats into an artists’ potential sales. But in this case, Samsung is essentially paying Jay-Z to leak his own album.